Although proofreading and post-editing are close relatives they aren’t synonyms. Recently, there have arisen discussion about how to price post-editing. Some professional translators are even ready to set up different prices for proofreading and post-editing. Evidently proofreading and post-editing bind translator’s resources differently. This is the key to find out how they differ from each others. 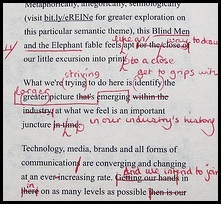 Proofreading is something every translator does (or at least should do) after the translating process has been done. The goal is to spot the possible typos and other minor mistakes. Proofreading requires little or no editing work because it is the final touch to the almost-ready translation. The actual work effort in proofreading can stay small also because the material is familiar to the proofreader or because the job is already very close to the finish. Like the term says, it is reading in order to proof that the work is properly done. Post-editing is nowadays a trending term due to the fact that it is nowadays strongly related to machine translation (MT). However, post-editing doesn’t require automatic translation; it can be done to any kind of translation. Nevertheless, the association with MT is very strong because, in principle, post-editing requires more work, i.e. editing, than proofreading does. Unlike machine translators, translation professionals rarely produce a translation that would need serious editing. In MT post-editing the starting point (the automatic translation) and the outcome (the post-edited translation) can be far from each others. The automatic translation is rather a pre-produced material to work with than an almost-ready translation. Another way to look at this is to consider who has done the initial translation. If the person has first translated the text and then checks the outcome through, the process can be called proofreading. But if the translation is made by someone else, it’s post-editing. The difference is in the effort needed to go through the text. When someone else has made the translation the material is not familiar to the translator. Then it takes more time to truly understand the text and to evaluate the translation. As a summary, proofreading is made to check that the translation is correct, while post-editing is employed to see whether the translation is correct − or not. The distinction is in the pre-assumption of the correctness of the translation. Still the translation quality of the finished translation is not depended on the used method. It is possible to reach as high translation quality with both proofreading and post-editing. Work 11-50% faster by combining translating and post-editing. Qualified machine translation improves translation efficiency remarkably. Test with your material to see how much faster you can work.